Welcome to the PancakeBot®; Forum! Please read our Frequently Asked Questions and browse through the different help topics on the left sidebar before posting. THIS FORUM IS MEANT FOR USERS TO HELP USERS. WE ARE HAPPY TO PROVIDE PERSONAL SUPPORT. For tech support, please email support@storebound.com or call (800) 898-6970. For user support, Please post your question or comments in the most relevant topic listed to the left. Be descriptive and clear so that others can understand your question and provide helpful, constructive feedback. Please keep our forum a clean and helpful place for our PancakeBot® community! For more information on our community guidelines, click here. Q: Can I use any pancake batter? A: Yes, you can but we recommend that you make it slightly runnier than regular pancake batter and that you strain your batter through a fine, mesh strainer to remove any clumps. You can make your own batter from scratch or buy ready made batter. Please refer to your instruction manual for our suggested recipe. Q: Can I create a large batch of pancake batter and store it in the fridge? A: Yes, but it may separate. Just make sure to stir the batter well before using it and don't forget to strain the batter before filling your Dispenser Bottle. We recommend that you do not store batter for more than 1-2 days. Q: Why is the batter printing in wavy lines rather than clean, straight lines? Ensure that the Dispenser Bottle is on the lowest setting (the Spine on the bottle should be inserted in the longest slot on the Dispenser Bottle Holder when printing. If you are not using the PancakeBot Electric Griddle, the tip of the nozzle should be about 15mm from the surface of the griddle. Make sure the tiny hole in the Dispenser Bottle cap is not blocked. You can use a small needle to unblock it if necessary. Lower the pressure in the bottle by turning the pressure knob - located on the control panel - counter clock wise. The pressure setting can be adjusted while you are printing and may vary from print to print depending on the viscosity of the batter. Q: Why is the batter printing out in little dots? A: This typically happens because of one of two reasons - first, the bottle may not be receiving any pressure from the air pump or second, the bottle tip is clogged. Make sure that there is air coming out of the tube that is attached to the bottle. Do this by removing the tube from the top and putting your cheek or hand against it. If there is no air coming out, check the cable connection attached to the base. If there is air coming out, then check that the nozzle is not clogged. Q: Can I speed up my PancakeBot? A: The speed of the PancakeBot is not adjustable with the first version of the firmware. In order to increase and control the speed, you need to update the firmware. Visit this link to update the firmware: http://www.pancakebot.com/firmware-update. Q: Why can I not fill the bottle above the fill line? The current bottle design has a cap with a low profile. Because the PancakeBot uses a vacuum/pressure system to control the batter, you want to make sure you do not fill the bottle above the line to prevent batter from flowing into the vacuum system. Q: I got batter in the hose on top and my PancakeBot does not work. What do I do? A: Should you get batter in the vacuum hose, immediately disconnect the hose from the gantry by pulling it out at the connect area. Check to see if any batter entered the gantry. If batter did not enter the gantry, then simply rinse out the hose and rinse the cap clean. If batter entered the gantry, most likely, the batter has clogged up the valves or vacuum pump. Immediately unplug the PancakeBot and remove the gantry. Follow procedures for cleaning the valve system in this video: https://www.youtube.com/watch?v=McWUxrZtSKU&feature=youtu.be. Q: There is way too much batter being dispensed. How do I fix this? Q: Why is the PancakeBot not dispensing any batter even though it's moving? There might be too little pressure inside the Dispenser Bottle. Try increasing the pressure using the pressure dial on the control panel. The nozzle may be blocked. Leaving the batter in the Dispenser Bottle for an extended period of time can cause the batter to dry from the heat of the griddle. Lumpy batter can also cause the nozzle to become blocked. Remove the Dispenser Bottle from the Holder, unblock the nozzle using a toothpick or straight pin, and then return the Dispenser Bottle to the Holder. The batter may be too thick. Thin it out using some milk or other liquid. Your pressure dial may be set to zero. Increase the pressure by turning the pressure dial - located on the control panel - clockwise. Q: Why do I not see my designs on the Display when I insert the SD card? have the extension of “.gcode”. The “.pbp” files are only for the Pancake Painter software. are stored in the root directory of the SD card and that the file names do not start with a number or exceed 8 characters. If it is still not working, make sure that your SD card is formatted to FAT32. Please note that SD cards should be smaller than 32GB in size. Q: What setting should I have my griddle on? A: We suggest that you start with the griddle on medium heat and adjust it from there. Each design will require a slightly different setting depending on its complexity and size. The larger or more complex the design, the lower the temperature should be. The simpler and smaller the design, the higher the temperature should be. It is also easy to adjust the temperature on the fly if you notice your pancakes are cooking too quickly or not quickly enough. The higher the temperature setting, the faster the sugar in the batter will caramelize resulting in higher contrast between the lines. You may consider having the heat at a higher temperature when the initial line work is done and then moving it to a lower temperature once the fill has started. Q: Why does the PancakeBot pause in the middle of printing? A: In order to achieve contrasting colors, the PancakeBot uses a combination of the griddle heat and timing between shades - the longer the batter is on the griddle, the darker it will become. The PancakeBot is programmed to pause between shades to allow for the batter to cook longer on some areas. This timing is controlled by the software and can be changed. The default pause is 25 seconds between shades. A higher temperature may require less cooking time. You can change the settings using the Pancake Painter software. Pausing between printing different colors also allows you to change the bottle if you would like to use a different or colored batter. Q: Can I adjust the number of seconds the PancakeBot pauses between shades? A: Yes. Before you export your design, select View > Advanced Settings on the menu bar and adjust the “Seconds Between Bottle / Shade Changes”. The lowest setting indicates the least amount of color contrast or waiting time between the printing of the different shades of color. The higher the number of seconds, the higher the contrast. However, be cautious when using the highest setting because you may have to lower the temperature of your griddle so that the pancakes do not burn before they have finished printing. The selected setting will be saved and used for all future designs so be sure to change the setting back to the default 35 seconds once you have exported the design. Q: Can I leave the PancakeBot on standby? A: Yes. However, for extended periods of time, we suggest turning both the griddle and PancakeBot off and placing the Drip Cap on the Dispenser Bottle’s nozzle to prevent the batter from dripping or drying within the nozzle. For shorter periods of time, lower the griddle’s temperature and make sure the Dispenser Bottle is placed in the highest position (the Dispenser Bottle Spine should be inserted into the shortest slot on the Dispenser Bottle Holder) to prevent the heat from drying out the batter. Q: Can I place the Dispenser Bottle in the dishwasher? A: Yes, but we recommend you remove the silicone seals in the Cap and Nozzle Connecter as they may get lost in the dishwasher. Hand washing is recommended in warm, soapy water. 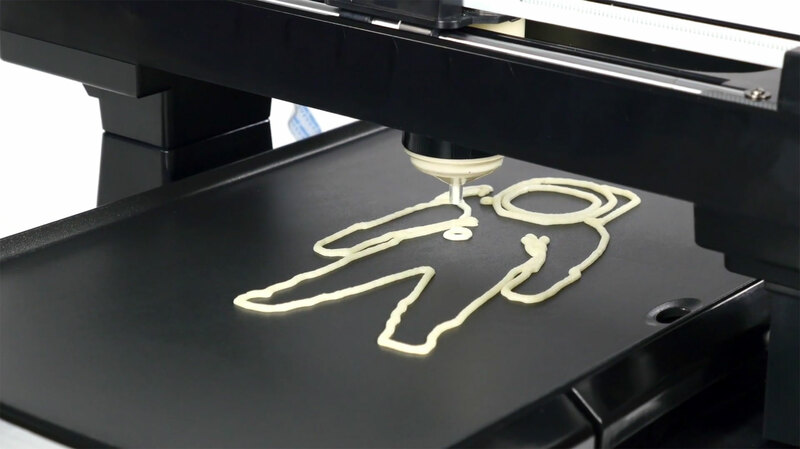 Q: Can the PancakeBot print anything other than pancake batter? A: The PancakeBot is specifically designed to print pancakes. However, it can theoretically print anything with the same viscosity as pancake batter, so you may want to experiment with your PancakeBot!